Hello everyone! Is it Sunday already? Yeah, time for another weekly recap. I hope you are looking forward to reading it and enjoy it as much as I really enjoy writing those posts. Here we go! 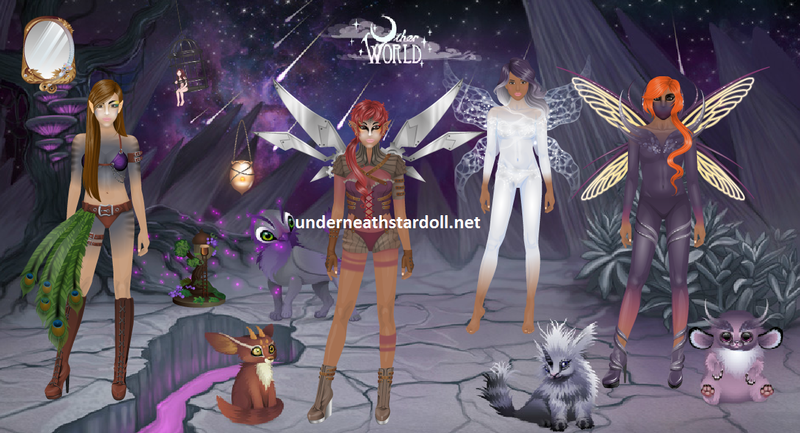 As we could see in spoilers the previous week, we got a new Other World collection on Monday. It is a nice change from 'ordinary' clothes, giving us a chance to spice up our virtual wardrobes with not so ordinary outfits, add some fantasy twist to our regular doll looks. Unless you are one of the minority users that actually wear those kind of outfits every day. I was not so much excited about the outfits, but I was happy to see 3 pairs of wings, to add to my wings collection. Hairstyles are good too, and I like that they go to our beauty parlors on the same place as Tress Up wigs go. Though I wouldn't mind 'regular' wigs that go to our suites either. On Tuesday, we got an update to our suite camera. The first thing we could notice is the addition of new camera effects, 4 of them to be exact. They are nice, (though pricier than the ones we already have). I don't really use them when taking photos in my suite, so I do not plan spending my stardollars on any, at this time at least. What I really loved was that we finally got a zoom in button. It is much easier now taking nice close up photos, without having to resize our doll and other stuff in our suites. What we would really use would be a zoom out button, so we can have a chance to take a photo of a whole room. I am not sure how would that work out though, considering that, well, our camera takes square photos, and our suites are in a shape of a rectangle. Again, I don't usually choose my favorites, but this one release really, really made me happy. I've been waiting for this for a long time, and now it is finally there. I am talking about, of course, the new store Ink'd - a store consisting of tattoos and piercings for our dolls! We've gotten a variety of tattoos, a 'tattoo sleeves', a full leg tattoos, chest tattoos, ankle tattoos, as well as some smaller ones. Some go to our suites, while others to beauty parlor. Like I said, I really love them, and I think they chose nice designs. Piercings are great too: we have ear piercings, eyebrow piercings, lip piercings, nose piercings, and navel piercings. I know not many people love wearing tattoos in real life, as they are permanent, and that's why Stardoll is great - we get to experiment with styles, wear stuff we'd never wear in real life, as well as try out many different tattoos and piercings. Prices are fair, and I see a real potential in this store, and hope and expect some new designs. 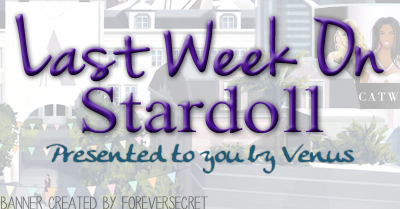 One suggestion to Stardoll: make a tattoo/piercing parlor as a segment in our beauty parlor, and put all tattoos and piercings there, also make them go under our clothes, as they usually do in real life. One 'beloved' store is leaving Starplaza soon, with a 50% off goodbye sale - I am talking of course about Decades. I was never a fan of the store. I may have liked few pieces of the first few collections, that's all. I don't have a particular 'style' on Stardoll, but those clothes just do not look good on my dolls. I know many do know a ways to style them, so if you are one of them, hurry and go grab the stuff before the store leaves permanently and you have to search in bazaars and pay higher prices. (Actually, now as I was writing this, took a few minutes break and bought some cheap nice pieces.) And finally we won't have to see anymore of those creepy dolls. One interior release this week, on Friday to be exact, and the store is Fallen Angel Decor. Kinda random release, anyone agrees with me? I mean, it is spring, and Halloween is far ahead. Okay, I know some users decorate their suites regardless of season/holidays. Okay, that red sofa is really gorgeous. What we (I) really want is some new way to store out clothes, arrange them by color/type, stuff like that. Anyway, it was an interesting week. 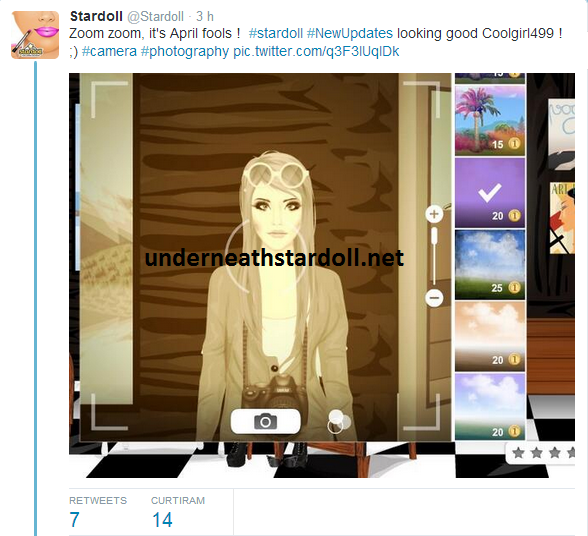 What I did not mention, as it wasn't mentioned as news here on USD, is that all users now have a new Stardoll layout. I like it, I like changes, but I am still waiting for updates they hinted on their Instagram, as I remember. Next week? Let's hope so. By then, chose your favorite moment, and see you next week.